It's almost summertime, the season of picnics, cookouts and family get togethers. In some ways, that season began Memorial Day weekend and is therefore already underway. This is a variation on a previous recipe that I've made a couple tweaks to, which I think makes it even better. I call it a "potato" salad because it includes ingredients common to the traditional picnic potato salad: sweet onion, red pepper, sweet pickles, fresh herbs and a tangy-sweet dressing. First, I roasted the chickpeas, which subtly changes their texture and flavor, making their exterior almost crunchy and their interior softer while softening and warming their flavor. I also eliminated the mayonnaise in favor of an olive-oil-and-vinegar dressing. This also makes the salad vegan--a welcome thing if you have vegans in your group given how "meaty" outdoor cookouts can be. This recipe is also delicious enough to please the nonvegans. 1. Preheat oven to 425 F. Line two baking sheets with aluminum foil. 2. Combine chickpeas, 1/4 cup olive oil, seasoned salt, smoked paprika and cumin in a large bowl. Stir to coat the chickpeas evenly. Divide the chickpeas among the two baking sheets and spread in an even layer. Bake chickpeas until golden brown, about 35-40 minutes, stirring at the halfway point. Set aside to cool. 3. 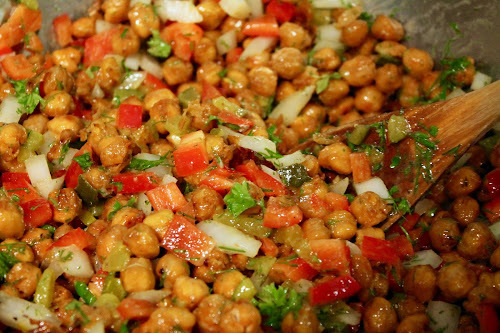 In a large bowl, combine the roasted chickpeas, sweet onion, bell pepper, sweet pickles, parsley and dill. In a small bowl, whisk together vinegar, mustard, agave nectar, smoked sea salt and black pepper, then whisk in the remaining 1/4 cup of olive oil. Pour dressing over salad and toss to combine. Serve immediately or refrigerate until ready to serve.